With exquisite cuisine served in an elegant and refined setting, The Brasserie befits an intimate tête-à-tête, weekend gourmet excursion or a light business dinner. The St Regis Kuala Lumpur is known for its 5-star service with a fine attention to detail. The Brasserie, located on Level 2 is no different. This contemporary establishment offers French-Mediterranean cuisine draped in modern European setting. From the onset, one will find the wide spaces and high ceiling a welcome treat, its unobtrusive setting keeps conversations private yet complimentary in a business setting. Table dining details are well catered to and the soft yellow overtones will suit the romantics. Nevertheless, for all its modern European charm, The Brasserie best befits an intimate tête-à-tête, weekend yarn or a light business dinner. A welcome avenue for a get together or simply to indulge in its fine culinary offerings. 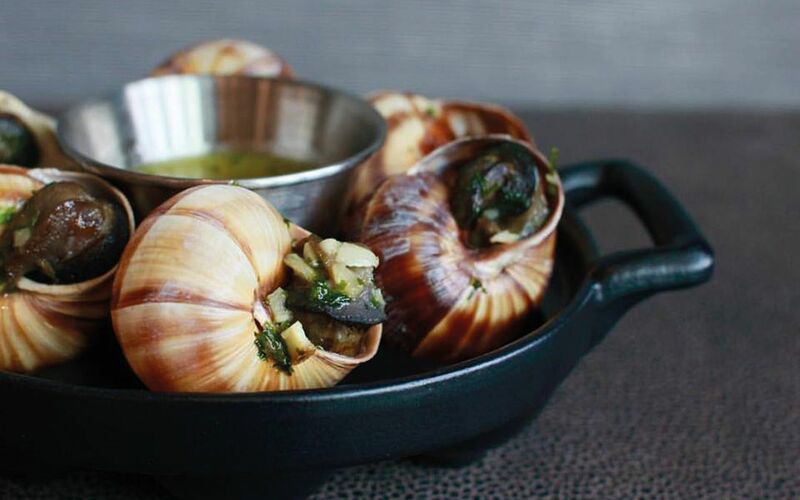 Though it be snails, the appetiser of escargot de Bourgogne is freshly prepared and served in a timely manner. Suggestions of its freshness is evident through the succulent and slightly crunchy exterior. A side serve of stretch crusty bread accompanied by a glass of Chateau Ducourt Blanc make for a natural pairing. The 120-day Angus grain-fed ribeye does not disappoint as the luxurious cut is grilled touch perfect, giving it a succulent char on the sides whilst being moist and tender in the middle. The meat comes medium as requested; it’s a luxurious cut that has all the right underlining concealed only by its modest presentation. A piquant side of béarnaise sauce and sprinkle of sea salt lends itself credibly to an already jewel of a dish. Offering a differing palate is the saffron seafood stew, with its rich salted juice from a fresh catch of prawns, mussels, clams and fish giving a wonderful burst of flavours. Served with a generous amount of baby potatoes, heart tomatoes and asparagus greens, and mixed in with the heady brew of saffron, butter and garlic sauce, the dish is both warming and delicious, especially with a side of stretch bread. Cap the culinary sojourn with the decadent chocolate molten tart. The mesmerising mound of molten chocolate is topped with a selection of vanilla ice cream cusp in a crunchy shell. This marriage of sin is then draped over in delectable caramel sauce, to appease even the staunchest of chocolate lovers. It is rich and delicious – definitely not for the restrained but proves itself an excellent combination that is a fitting afterthought to the Angus. Wines are mostly whites and reds from Europe and South America, with price points within the mid RM50 per glass to mid RM200 per bottle to suit the French-Mediterranean palate on offer. The non-alcoholic selection comprises freshly squeezed juices, sparkling water and the establishment’s own specialty drinks like local juice concoctions. The restaurant staff was welcoming at the entrance, and while the waiters did not exactly present a warm presence, they certainly did go about the standard courtesy as expected from such an establishment. The service and mannerisms are short, pointy and unobtrusive. Service is prompt, from taking orders to clearing plates and refilling the glasses, but mostly staff are nonchalant and would leave guests to their own. While the service is prompt, an occasional smile is always welcome. An impressive culinary experience overall. A dinner for two with starters, wine and dessert would be within RM500. Fair value for the Angus ribeye (RM207), which is a palate pleasing luxury and the chocolate molten tart (RM40) is definitely a welcome decadence. The saffron seafood (RM110) is fresh and begets its price, and while the menu is not the most extensive, the ambience of The Brasserie complements the value of such a dining venue. Best suited to a weekend tea party or an intimate dinner for two.